Ridding the world of excessive noise isn’t an easy task, but it’s one Noise Free America: a Coalition to Promote Quiet is willing to tackle. Their mission is to raise awareness of the negative effects of noise pollution in order to reduce noise in our communities. Ted Rueter founded Noise Free America in 2001, when he was a professor at UCLA and living in Los Angeles. Today the organization has more than 50 local chapters in 25 states, each with the mission of educating the public about noise pollution. Why does noise pollution matter? Excessive noise causes hearing loss and negatively impacts health. Organizations such as the World Health Organization, American Speech-Language-Hearing Association and U.S. Census Bureau have identified noise pollution as a real and present danger to human health and well being. According to the National Institute on Deafness and Other Communication Disorders (NIDCD), as many as 26 million Americans have high frequency hearing loss likely caused by exposure to excessive noise. In addition to hearing loss, excessive noise is linked to tinnitus, sleep deprivation, cardiovascular disease and an increased risk of mental illness. 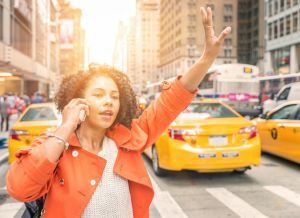 A recent scientific literature review published in European Cardiology Review concluded there is a connection between exposure to everyday transportation noise and high blood pressure. Further, it determined that noise pollution should be considered as a new risk factor for cardiovascular disease. A German study published in 2016 found depression and anxiety increased as annoyance from noise increased. Noise Free America believes the answer to this problem is for each state to adopt a comprehensive noise code which regulates the decibel (dB) levels on everything from noisy cars and lawn equipment to barking dogs, construction, trash removal and recreational vehicles. Their legislative agenda is outlined on the website. Take action. Sign up to receive Noise Free America’s updates and alerts on fighting noise pollution. Volunteer to help with lobbying, research, fund raising or community outreach. Write your local, state and national representatives and ask them to support legislation for anti-noise ordinances. Join a local affiliate of Noise Free America or form one of your own. Donate to the cause. Information on all of these options is available on Noise Free America’s website. Get educated. Download Noise Free America’s How To Fight Noise manual. The 67-page document identifies what noise pollution is and how it’s harmful to your health as well as provides information on how to start a local chapter, tips on how to fight noise in your community, quiet alternatives to common noise-making products you can use in your own home and suggestions on wording for petitions and letters to elected officials. Be a good neighbor. Be mindful of the amount of noise your household contributes to neighborhood pollution. Monitor your use of outdoor lawn equipment and consider using quieter alternatives whenever possible. Talk to your family about acceptable times to play with loud toys or recreational vehicles to respect your neighbors’ peace and quiet. Work with your dogs to control excessive barking, if necessary. Protect yourself and your family. Noise induced hearing loss is permanent; however, it’s also the most preventable type of hearing loss. Wear earplugs or headphones when you know you’ll be in noisy environments such as sport stadiums or music concerts. Reduce the volume on your personal electronic devices, televisions and car radios. Most importantly, make hearing health a priority. Schedule regular hearing evaluations for the whole family and follow recommended treatment. When you model good hearing health habits, others notice. The example you set may be the catalyst for positive change in the fight against noise pollution in your community. Do Wireless Hearing Aids Present a Health Risk? As public awareness of wireless hearing technology grows, hearing healthcare professionals may notice an uptick in long-term safety concerns being expressed. Consumers should be confident knowing that wireless hearing aids are safe and strictly regulated medical devices that meet governmental wireless communication standards in addition to those set forth for medical devices. 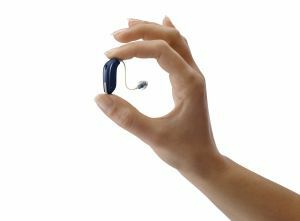 The integration of wireless technology and hearing aids has fundamentally reshaped the direction of the hearing industry. Today, wireless hearing aid users benefit from smartphone connectivity, while future changes to the Bluetooth® standard will permit nearly universal hearing aid interconnectivity. These future hearing aids will do more than adapt to the user’s environment; rather, they will become part of a mesh of wireless devices that interact with any number of other wireless devices in a given space or across a wireless network. In this article, we will discuss the current state of wireless hearing aid technologies and how wireless hearing aid systems are being designed to be both effective and safe to use. Figure 1. The health impacts of electromagnetic radiation differ based upon the frequency. Wireless hearing aid technology is non-ionizing and has only theoretical heating properties. The second type is non-ionizing radiation, which is comparatively benign. Non-ionizing electromagnetic energy is emitted by all wireless devices during communication and has a thermal or warming effect rather than an ionizing effect. According to the WHO, RF energy may be converted into heat energy as it is being absorbed by body tissue, but it is safe within certain dosage levels.3 Some industrial heaters use RF energy for drying; these are the only applications of RF radiation that have been found to raise body temperature by more than 1° C. The thermal effects of low-powered wireless radiators (ie, consumer electronic devices and hearing aids) are almost non-existent. Wireless technologies, including those used by the hearing aid industry, are strictly regulated to ensure both public safety and communication reliability are maintained. Even governments in developing countries have adopted regulations consistent with those enforced in the United States or the European Union (EU). In the United States, wireless hearing aids are classified as Class II medical devices while traditional hearing aids are classified as Class I medical devices. This elevated classification requires that wireless hearing aids conform to the regulations set forth by both the US Food and Drug Administration (FDA) and the FCC. Similarly, wireless hearing aids must conform to both the Medical Device Directive14 and Radio Equipment Directive15 in order to become certified for distribution within the EU. The regulations set forth by the FCC and Radio Equipment Directive each define the appropriate frequency bands and respective broadcast strengths at which wireless devices may communicate. Much like air traffic control, these wireless regulations were established to prevent overcrowding certain frequency bands, which could lead to excessive interferences. Limits on overall power output also serve to protect the population from being exposed to hazardous levels of electromagnetic radiation. In terms of public safety, Specific Absorption Rates (SAR) are, perhaps, even more informative than output energy levels. In fact, the FCC states that “Guidelines for human exposure to RF fields are based on SAR thresholds where adverse biological effects may occur.”16 Theoretically, RF radiation could become problematic when an excessive amount of energy is absorbed by body tissues. Similar to how excessive exposure to the sun’s ultraviolet (UV) radiation causes sunburn and could eventually lead to increased risk of melanoma,17 high levels of absorbed RF energy could cause body tissue to heat up and potentially cause damage to the living cells within the body. At extreme levels, non-ionizing electromagnetic radiation would act similarly to how food is heated within a microwave oven. Therefore, the FCC and the Radio Equipment Directive each regulate the maximal SAR levels at which wireless devices may operate. The regulations which regulate wireless hearing aid Output Power and SAR are summarized for the US and EU in Table 1. Table 1. Summary of maximum allowable output and Specific Absorption Rate (SAR) limits which govern wireless hearing aids in the United States18,19 and the European Union.20-23 The Output Power data were converted from dBm to mW for comparison. By design, hearing aids radiate extremely low levels of energy; therefore, the levels of electromagnetic energy that wireless hearing aids radiate are well below the maximum levels permitted by governing regulations. 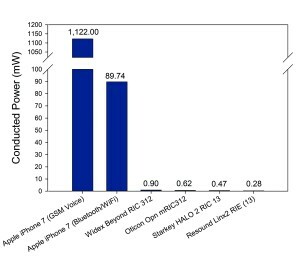 The amount of conducted power output for various 2.4 GHz hearing aids are compared to the conducted power output of a representative smartphone in Figure 2. Based on these measured data, it is reasonable to conclude that the conducted power of 2.4 GHz hearing aids are significantly lower than those of cellular phones. Figure 2. Summary of the conducted RF power output measurement of the Apple® iPhone® 7 (model A1660)24,25 and various 2.4 GHz wireless hearing aids are plotted.26-29 The GSM Voice measurement was made at 1900 MHz. The typical SAR values for wireless hearing aids range between 0.001-0.02 W/kg. In other words, the amount of electromagnetic radiation absorbed from wireless hearing aids is anywhere between 80 to 2,000 times less than what regulations would allow (1.6-2.0 W/kg). The variability in this range is directly tied to the wireless technology and radio frequency spectrum used in the device. At these measured levels, a patient would have to wear either 75 individual hearing aids that broadcast at 2.4 GHz or 1,125 individual hearing aids that broadcast at 900 MHz, simultaneously, in order to absorb the same amount of energy that we experience when holding a mobile phone to our ear. Prior to being released to the market, a wireless hearing aid’s conformity to each country’s wireless regulations is certified. In the United States, a third-party Telecommunications Certification Body (TCB) laboratory must measure and certify the device’s compliance to FCC standards.29 A TCB is then also able to audit the manufacturer’s devices’ for ongoing conformance, at any time, following the certification of the device. It should also be noted that each wireless hearing aid must meet the wireless standards of the country in which they are intended to be used, not the regulations of the device’s country of origin. Hearing aid manufacturers strive to optimize their wireless hearing aid offerings both in terms of connection reliability as well as power efficiency. Variance across patients and listening conditions can make optimizing wireless hearing aid systems a complex process. Factors such as connection distance, proximity of reflective surfaces, interference from other wireless devices, and energy loss through body absorption must all be factored into the hearing aid design. For example, indoor wireless performance may be very different from wireless performance experienced outdoors, where the only reflective surface may be the ground on which the hearing aid user is standing. Furthermore, individual differences in body geometry increase the variability that wireless engineers must account for when designing a system that provides each user with a consistent and reliable experience. The RF radiation of hearing aids is so slight that highly specialized equipment must be used to measure and optimize the performance of hearing aid prototypes. 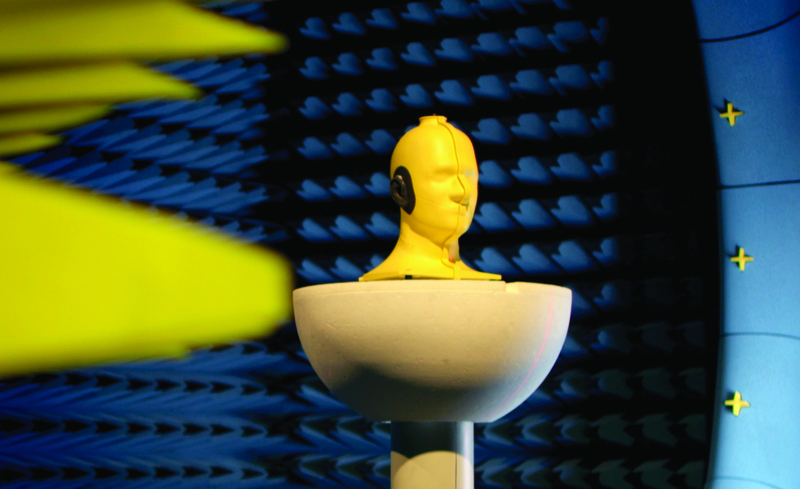 At Starkey Hearing Technologies, wireless engineers leverage a state-of-art, anechoic SATIMO chamber (Figure 3) to measure the propagation of RF radiation from various antennae and hearing aid designs. Simulations and measurements can be performed either in free space, fixed to a mannequin head, or worn by a research participant. The goal of wireless optimization is to provide consistent signal transmission and reception while using the least amount of energy possible. An emphasis on energy efficiency maximizes battery life and allows for more signal processing resources. Figure 3. Mannequin head placed within the anechoic SATIMO chamber at Starkey Hearing Technologies’ research facility in Eden Prairie, Minn.
As awareness of wireless hearing technology grows, hearing healthcare professionals may notice an uptick in long-term safety concerns. Consumers should be confident knowing that wireless hearing aids are safe and strictly regulated medical devices that meet governmental wireless communication standards in addition to those set forth for medical devices. ETSI EN 300 328 v 2.1.1, Electromagnetic compatibility and Radio spectrum Matters (ERM); Wideband transmission systems; Data transmission equipment operating in the 2.4 GHz ISM band and using wide band modulation techniques; Harmonized EN covering the essential requirements of article 3.2 of Directive 2014/53/EU, 2016. ETSI EN 300 330-1 V1.8.1 2.1.1, Short Range Devices (SRD); Radio equipment in the frequency range 9 kHz to 25 MHz and inductive loop systems in the frequency range 9 kHz to 30 MHz; Harmonised Standard covering the essential requirements of article 3.2 of Directive 20152014/53/EU, 2017. ETSI EN 300 422-1 V1.5.1, Electromagnetic compatibility and Radio spectrum Matters (ERM); Wireless microphones in the 25 MHz to 3 GHz frequency range; Part 1: Technical characteristics and methods of measurement. June 2015. 1999/519/EC: Council Recommendation of 12 July 1999 on the limitation of exposure of the general public to electromagnetic fields (0 Hz to 300 GHz). Official Journal of the European Union. 1999;42(L199/59):59-70. UL Verification Services Inc. Certification Test Report for Cellular Phone with Bluetooth and WLAN Radios Model Number: A1660, A1780 (No. 16U23309-E6V4). Fremont, Calif: UL;2016. Retrieved from FCC Equipment Authorization Database. UL Verification Services Inc. Certification Test Report for Cellular Phone with Bluetooth and WLAN Radios Model Number: A1660, A1780 (No. 16U23309-E1V4). Fremont, Calif: UL;2016. Retrieved from FCC Equipment Authorization Database. AT4 Wireless. Test Report for Wireless hearing instrument Model: BRIE (No. 43932RRF.002). Málaga, España. 2014. Retrieved from FCC Equipment Authorization Database. CETCOM ICT Services. Test Report for Wireless hearing instrument Model: Aurora mini RITE (No. 1- 0682/15-2–7). Saarbruecken, Germany. 2015. Retrieved from FCC Equipment Authorization Database. Element Materials Technology Warwick Ltd. Report on the Radio Testing For Widex A/S on Widex Beyond Fusion2 (Model. B-F2) (No. TRA-029062-01-45-04B). London, England. 2016. Retrieved from FCC Equipment Authorization Database. US Federal Communications Commission. Code of Federal Regulations, 47 C.F.R. Part 2, Subpart J-Equipment Authorization Procedures (2015). When the United Nations General Assembly originally proclaimed March 3 as World Wildlife Day in 2013, their goal was to celebrate and raise awareness for the world’s wild animals and plants. In celebration of conservation in general, Healthy Hearing thought you’d be interested in a few fun facts about animals’ hearing ability. Awareness on any level is key to protecting our valuable resources, whether it’s our animal friends or the sense of hearing which connects us to the world around us. 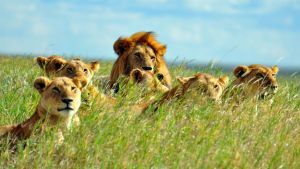 The theme for UN World Wildlife Day 2018 is big cats, such as the lion, tiger, leopard and jaguar, cheetah, snow leopard, puma and clouded leopard. While these elegant members of the wild use their keen sense of hearing primarily to hunt prey, even the most pampered of domesticated cats have excellent hearing. They can detect an extremely wide range of frequencies, hearing higher-pitched sounds than humans or dogs. While a human ear consists of three muscles and the three tiniest bones in the body, a cat’s ear is controlled by close to three dozen muscles, which allow them to rotate their ears 180 degrees. By today's standards, most dogs would not be considered wildlife with all the creature comforts lavished upon them by dog lovers, but dogs' sense of hearing is impressive when compared to that of their owners. According to Bark magazine, the frequency range dogs can hear is far greater than that of humans. That's why dogs can hear the ultra high-pitched pulse of the crystal resonator in most alarm clocks and even vibrations emitted by termites inside building walls. Their ears can move independently of one another. If you pay close attention to your best friend, you can gain clues about his mood from the position of his ears. Birds in the wild rely on their keen sense of hearing to either alert them of danger or, in the case of birds of prey, to find their next meal with amazing precision. Owls, for example, have crooked ears. One ear is located slightly forward than the other, which aids them in pinpointing sounds of their prey. Because they are nocturnal animals, their hearing works in tandem with sharp sight to help them hunt successfully in the dark. During flight, an owl's left ear picks up sounds from below while the right ear hears sounds from above. Consider the lowly moth, an insect that has spent so many centuries evading predators that its hearing has evolved to being the best in the human and animal kingdom. Scientists say some species of moths have hearing 150 times more sensitive than any human. Their ability to hear the highest frequencies (300 kilohertz), helps them escape bats, their main predator, before they are attacked. You may be surprised and even a little troubled to know that spiders - part of the arachnid family - cannot only see you, they can hear you too. An accidental discovery by researchers at Cornell University led them to delve deeper into how spiders hear and respond to sound. As it turns out, spiders are most sensitive to low-frequency sounds and, by using tiny hairs on their forelegs, could "hear" the researchers clap from 5 meters away. Although the reptilian auditory system is relatively similar across the species, reptiles don’t all hear the same. Snakes, for example, don’t have an outer ear or eardrum. Instead, a bone in their jaw moves in response to vibrations they detect on the ground and in the air. This movement is transferred to the inner ear, which is sent to the brain to be interpreted. Lizards, on the other hand, have visible openings with eardrums just below surface of their skin. While they don’t hear as well as humans, they are able to hear better than snakes. Did you know the human ear evolved from fish gills? That’s what scientists believe. Today of course, human hearing is vastly different from that of a fish. In addition to ear parts inside their heads, fish have lateral lines which run down the side of their body and help them pick up sounds in the water. Dolphins use echolocation to hear where they are going. By emitting a squeak, the sound bounces off surfaces and back to its lower jaw, providing a sound map of what’s ahead. Their teeth also help with hearing, acting like an antenna to help receive incoming sound. Scientists say dolphins have a hearing range from 20 Hz to 150 kHz, which is seven times better than humans. Hearing is such an important sense for all members of the animal kingdom, including humans. Even though we may not be able to hear as well as some of our animal friends, we do have some advantages. Thanks to hearing healthcare professionals and advancements in technology, our hearing can be evaluated and treated, helping us hear our best throughout our lifetime. Preserve your sense of hearing by turning down the volume on the television and other personal electronic devices, protecting your ears from loud noise and having annual checkups with a hearing healthcare professional you trust. You’ve been diagnosed with hearing loss and your hearing care professional recommends hearing aids. Thanks to today’s technology, you have a variety of styles and manufacturers to choose from, including some which fit so discreetly they are virtually invisible. Which one should you choose? many small hearing aid options. The most discreet small hearing aids include custom styles like completely in the canals (CIC) and invisible in the canals (IIC). Both of these types fit deep inside the ear canal, hidden in the contours of the ear. Although social stigmas may have you leaning toward smaller, more discreet custom devices, these models aren’t suitable for everyone. How do you know if they are right for you? Here are a few pros and cons for you to discuss with your hearing healthcare professional. If you want to channel your inner James Bond or just prefer to make it less obvious that you have hearing loss, these devices are as close to being invisible as they get. There are no external tubes or wires. Because they are lightweight and custom molded to fit inside your ear canal, they are comfortable for most wearers. Their position inside the ear canal makes it easier to use telephones and headsets. The outer ear protects them, making them less likely to pick up wind noise when you're enjoying outdoor activities. They can result in more natural sound for some wearers. 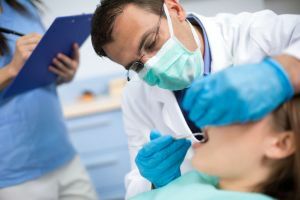 Their location in the ear canal can reduce the bothersome "occlusion effect," which is sometimes described as sounding like you are talking "in a barrel." Their proximity to the eardrum means they need less power to transmit sound, which means they are less likely to produce feedback (whistling). These small hearing aids aren't suitable for people with severe, more advanced hearing loss. They work best for mild to moderate losses. If your hearing loss is worse than that, you may hear better wearing a behind the ear (BTE) model, which can pack more power inside. They don’t fit in everyone’s ear canal. Those with short or differently-shaped ear canals can’t wear them. You'll change batteries more often. According to a June 2016 article in HearingTracker.com, batteries in BTE hearing aids last between 110-135 hours while those powering smaller devices last between 61-98 hours. Features can be limited. There isn’t enough room for directional microphones, one of the most helpful advanced technologies for hearing in background noise. Consider your listening environments. What sounds do you most want to hear? If you are a student, still employed, or find yourself in a lot of social situations involving noisy restaurants, family gatherings or public transportation, the technology in a BTE may be more suitable for your lifestyle. What if small hearing aids aren't right for you? If your hearing care professional discourages you from wearing small custom hearing aids, it doesn't mean you are destined for devices that won't suit your style. Small hearing aids aren't the only types that can be super discreet. Inconspicuous behind the ear hearing aids called receiver in the ear (RITE) or receiver in the canal (RIC) have surged in popularity in recent years in part because they are extremely discreet when worn. The devices themselves are small and sleek, fitting snugly behind your ears. They are coupled to the ear canal with a very thin, clear tube that will easily go unnoticed. The colors of the devices are designed to blend with most any hair or skin color. RIC and RITE devices are lightweight, comfortable and can be fit on wearers who have even a severe hearing loss. They are easy to see and easy to handle, so they are often a satisfactory solution for people who don't want their hearing aids noticed. If this sounds overwhelming, don’t worry. This isn’t a decision you have to make by yourself. The personal information you discuss with your hearing healthcare professional -- such as lifestyle needs, listening environments and budgetary concerns -- will help determine which hearing devices are best suited for your hearing loss. If you’ve recently been diagnosed with hearing loss, you’re in good company. According to the National Institute on Deafness and Other Communication Disorders (NIDCD), one in eight people in the United States over the age of 12 has hearing loss in both ears. Of the three types of hearing loss, more than 90 percent is sensorineural. Having sensorineural hearing loss means you have damage to the hair cells in your inner ear or to the nerve pathways that lead from the inner ear to the brain. While much of sensorineural hearing loss is age-related, there are other factors that may cause it, too. Many people with sensorineural hearing loss report that they can hear, but they cannot understand speech. This is especially true in the presence of background noise, and it can be frustrating. There are two types of sensorineural hearing loss: congenital and acquired sensorineural hearing loss. Aging: One of the most common conditions of growing older is presbycusis, or age-related hearing loss, affecting one in three Americans between the ages of 65-74. Because this type of loss occurs over time, typically in both ears, it’s sometimes difficult to notice. Noise: According to the NIDCD, approximately 15 percent of Americans between the ages of 20 and 69 suffer from noise-induced hearing loss (NIHL). NIHL can be caused by exposure to a one-time loud noise, such as an explosion, or to sounds louder than 85 decibels (dB) over an extended period of time. If you have to shout to be heard or your ears ring after attending a live concert or ballgame, your hearing health is at risk. Disease and infections: Viral infections, such as measles, meningitis and mumps can cause sensorineural hearing loss. Head or acoustic trauma: Damage to your inner ear can also be caused by a blow to the head or exposure to an extremely loud noise, such as an explosion. Many of our veterans suffer from sensorineural hearing loss due to time they spent around firearms, artillery and jet engines. Tumors: Examples of common tumors include acoustic neuroma, a benign tumor that affects the auditory system and cholesteatoma, an abnormal skin growth in the middle ear. Medications: According to the American Speech-Language-Hearing Association (ASHA), more than 200 medications and chemicals are ototoxic, or damaging to your hearing health. Some of those known to cause permanent damage include certain types of antibiotics, anti-inflammatory medications and cancer chemotherapy drugs like cisplatin and carboplatin. 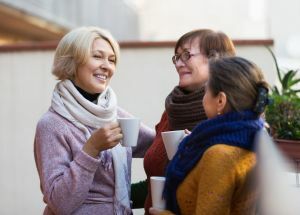 Although most sensorineural hearing loss is permanent, many with presbycusis or acquired sensorineural hearing loss may benefit from wearing hearing aids. Those with severe sensorineural hearing loss – congenital or acquired – may benefit from a cochlear implant, an electronic hearing device which is surgically implanted directly into the inner ear with an external portion worn behind the ear. Of course, the first step to better hearing is to have a thorough hearing examination from a qualified hearing healthcare professional. They can work with you to determine the cause and extent of your hearing loss, as well as develop an individualized plan to treat it. As we consider our heart health during the month of February, it’s also important to understand the role good circulation plays in our ability to hear. A healthy cardiovascular system, researchers have discovered, is healthy for the auditory system, too. According to the Centers for Disease Control (CDC), heart disease is the leading cause of death in both men and women, killing nearly 610,000 people every year in the United States. Those with cardiovascular disease can have a variety of medical issues affecting the structure and vessels of the heart. The most common types include those which narrow or block vessels leading to chest pain, or a heart attack or stroke. Others include those which affect your heart’s muscles, valves or rhythm. So what does your heart health have to do with your hearing? It’s all about blood flow. Studies have shown that good circulation plays a role in maintaining good hearing health. Conversely, inadequate blood flow and trauma to the blood vessels of the inner ear can contribute to hearing loss. That’s because the delicate hair cells in the cochlea, which play an important role in translating the noise your ears collect into electrical impulses for the brain to interpret as recognizable sound, rely on good circulation. Poor circulation robs these hair cells of adequate oxygen, causing damage or destruction. Because these hair cells do not regenerate, it results in permanent hearing loss. 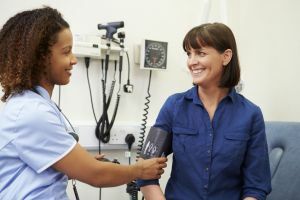 In a study published in the June 2010 issue of the American Journal of Audiology, authors Raymond H. Hull and Stacy R. Kerschen reviewed research conducted over the past 60 years on cardiovascular health and its influence on hearing health. Their findings confirm that impaired cardiovascular health negatively affects both the peripheral and central auditory system, especially in older adults. Although sensorineural hearing loss is permanent, you may be able to help preserve your hearing by adopting a physician-approved fitness program which includes cardiovascular exercise. A study by researchers at Miami University discovered a positive relationship between hearing acuity and cardiovascular exercise. The study followed 102 non-smoking volunteers from Indiana and Ohio ranging in age from 22-78, whose hearing was evaluated after riding a stationary bicycle. Researchers concluded those with higher cardiovascular fitness levels had better hearing, especially among those age 50 and older. A larger study published in the American Journal of Audiology in June 2017 by researchers at the Department of Health, Exercise Science and Recreation Management at the University of Mississippi, Oxford, analyzed data from the 2003-2006 National Health and Nutrition Examination Survey (NHANES) and involved 1,070 participants, 30 years of age and older. Those who were more physically active displayed lower triglyceride levels. High triglyceride levels are associated with hearing loss. Charles E. Bishop, AuD, Assistant Professor in the University of Mississippi Medical Center's Department of Otolaryngology and Communicative Sciences, encourages Americans to take cardiovascular disease seriously, both for it's life-threatening effects and impact on all areas of life, including hearing health. "Hearing health should not be assessed in a vacuum," said Bishop. "There is simply too much evidence that hearing loss is related to cardiovascular disease and other health conditions. It's time we maximized the information we have in order to benefit the individual's overall well-being." Researchers hypothesize low frequency hearing loss could be an indicator of the presence or potential development of cardiovascular disease. Start your journey to better health by making an appointment with a qualified hearing healthcare professional. If hearing loss is detected, follow treatment guidelines and follow up with your family physician.